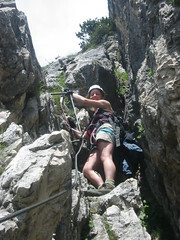 Trip to the Dolomites to discover more Via Ferrata with Annette. Ryanair initially want £120 excess baggage, so we lose the tent at the airport. Arrive in Milan at 3pm. Thomas gives us directions over the phone to the Decathalon in Brescia to buy a new tent. 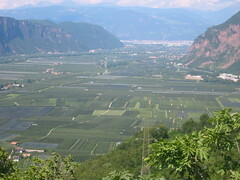 Drive via Trento and down towards Cortina. Sleep in a layby from 10:30pm near Ospitale. Have a bottle of red wine and Italian meats for supper. Swap seats at about 5am. Sleep till about 8am. I have a wander round in the morning and find a nice place by the river that we could have camped. Book into the Olympia campsite at about 9am, put up the tent. Have breakfast in the campsite caf�. Drive into Cortina town centre to sort out a few things, call for a drink at the Sports bar, go inside when a thunderstorm starts at about 3pm, very spectacular, lots of rain. Back to the campsite for showers and then back into town to eat at the Five Torri. Sunday 27th Raining in the morning. Drive up the Falzarego pass and drive up to the Rifugio Dibona, have egg, bacon and roast potatoes, very good. 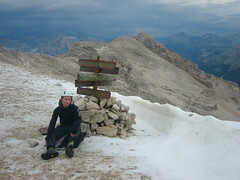 Walk up route 202 to Rifugio Pomedes, good views down to Cortina, very hot. Into Cortina in the evening, go up the tower on the main street. Eat at the Croda, rather disappointing. Annette fetches Croissants and does boiled eggs with ham for breakfast. Drive into Cortina to get money and sleeping mats. See the people at the Alpine club and decide that we cannot get separate insurance and that we will have to go without. Drive to Tre Croce and go to the Cristallo range. Fun getting into the rather bizarre red and yellow bubbles. Arrive at Rifugio Lorenzi. I take one look at the staircase across a vertical face and it gives me the shakes. Decide to have a quick go on the Ivano Dibano VF. Get over most of it rather easily, head back to Lorenzi for beer, book to stay tomorrow night. Down the lifts and back for showers. Into town and eat at the Five Torri again. Woken by noisy campers at 6:30am. Annette does breakfast of beans and bread. Leave car just up from Ospitale at 9:45, drop down and follow the 208 valley track for a short way. Ascent steeply for 2 hours through forest. Very hot, burn in the sun, concerns about not taking my sun hat, not enough water etc. Start up the Rene de Pol VF at noon. Sign our name in the route book. I am very out of breath all the way up. Get to the top of the Punta Ovest for 2pm. Have lunch of ham and eggs sitting on the ridge. Just as we finish a big thunderstorm starts. Continue up and it starts heavy rain and then hail, shelter in a cave from 3pm till 5pm. Phil Elliot phones about the EMS at Stennis, the hail is so loud it is difficult to hear him. Leave at 5pm with light rain. Everywhere is white over when we come out of the cave. We hear and see a loud mud slide, 200 yards away. We can see the Ivano Dibona bridge in the distance. 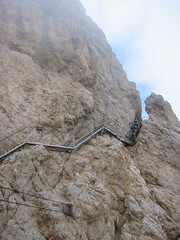 At 5:15 we meet two German women who say that the path is impassable and that we should go down with them, continue on. Very difficult section of scree covered by snow and hail. As we go up a rock comes spinning past us from above. Arrive at the start of the Ivano Dibona VF at 19:00. Very slippery, quite hard. Arrive at the Rifugio Lorenzi at 8pm, more heavy rain arrives 10 minutes later. We are the only residents. Very comfortable bed, kept awake by something sweaking on the roof in the wind. Good breakfast at the Rifugio at 8am, hang around on the terrace and watch people walk up the scree since the red and yellow buckets were broken by last nights storm. Talk with a couple from New Zealand who are the first to make it to the top. Contemplate doing the Cima de Roma, but the altitude is taking effect. Have lunch there and decide to walk down the scree, very steep with loose rocks. Some Germans run past and I am almost hit by a spinning rock. Arrive at the next chairlift at 3pm. 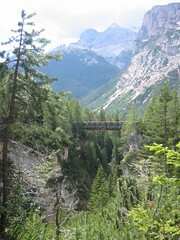 Catch a bus into Cortina and then on to Ospitale. I walk up and fetch the car. Sit in the sun lounges at Ospiatale and have a large beer at 5pm. Drive into Cortina and we can just see Lorenzi. Back to eat at the campsite for 6pm, pizza, gets better with lots of chillie oil. During the meal a thunderstorm starts, torrential rain and lots of lightening till midnight. Dry everything out from last night. Hire bikes out from across the road at noon. Have a bit of a false start with trying to find the railway line up the valley and we end up pushing and carrying the bikes up a steep scree slope. Very good track when we get onto it. Go though an illuminated tunnel and over the Felizon gouge. Stop for lunch at Ospitale. Annette gets talking to a couple of Italians who explain all the menu to her in detail. I have spatze followed by Pork steak. Cycle back along the river Boite, I have a little paddle in the river, very hot. Get the bikes back for 6pm. Go out for a drive and almost get up to Col Duscie. Back to the campsite for a while and then set off in the car in search of some late sunshine. Go up past Cimabanche and on to Misurina. We see Rifugio Auronzo in the sunshine and head up a long winding road to Tre Cimes. This is a toll road, but for some reason the man just waves us through. Back to Cortina for pizza in the Five Torri. Heavy rain starts at 9:30pm, big lightening. We have to rush back to the campsite to avoid getting looked out at 11pm. Hot sunshine in the morning. Leave the tent at 11:30am and walk to the Hotel Fiames. Very steep scree slopes up to the start of the Michelli Strobel VF. Start the route at 1pm. Walk along a ledge for a fair way to start. The start is rather challenging and we contemplate turning back, still fantastic weather. Very challenging climb with lots of exposure. The wind gets quite gusty and a little rain before we go up the ladder. End the wire at about 15:45. I am in only a t-shirt and shorts, rain and thunder starts. Get to the top of the scree for 16:10. Have our first chat with Andy and Pete. They went up to the cross on Punta Anna and it was buzzing loudly. Lighening is striking close by as we come down the scree. Have a couple in the Hotel Fiames bar. Quick shower and then pick up Andy and Pete in town and go to Ospitale. Have a fantastic meal there. Give them a lift back to their campsite on the other side of town. Drive over the Falzarego and the Pordoi and along the Val di Fassa. Join the Autostrada near Bolzano. Turn off the Autostrada and head for Riva del Garda, bit of a queue to get to Lake Garda. Fantastic to see it for the first time. Drive along the east shore to get the best of the sunshine. Think about a quick dip, but decide to have a look at Venice instead. Queue for about an hour on the A4 just to get past the toll booths. 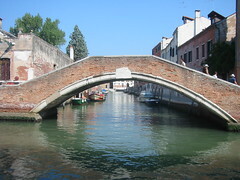 Drive over the bridge to Venice island, park at San Marco, car park. Walk along Feroaviva. Check into the Hotel Tivoli. 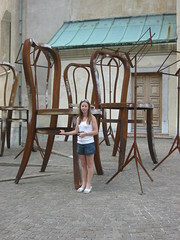 Walk through a lot of back streets, arrive at the Realto bridge, push on to St Mark's square. Arrive at about 12:30. Get quoted 70 euros to get back on a water taxi to the hotel. Go on a free water bus in the end. Only see a couple of rats. Breakfast outside and then quickly check out and go for a walk round the streets again. Enjoy driving along the motorway to Bergamo.